First you order your "green beans". We order ours from www.SweetMarias.com They have an amazing selection of beans from all over the world. They travel the world to find the best of the best. Second, you turn your machine on and get it warmed up. Third, you pour your green beans into the hopper that takes it down to the barrel. 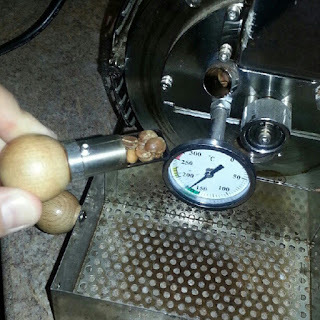 The barrel reminds me of a bingo game barrel...it rolls it around while it roasts the beans. 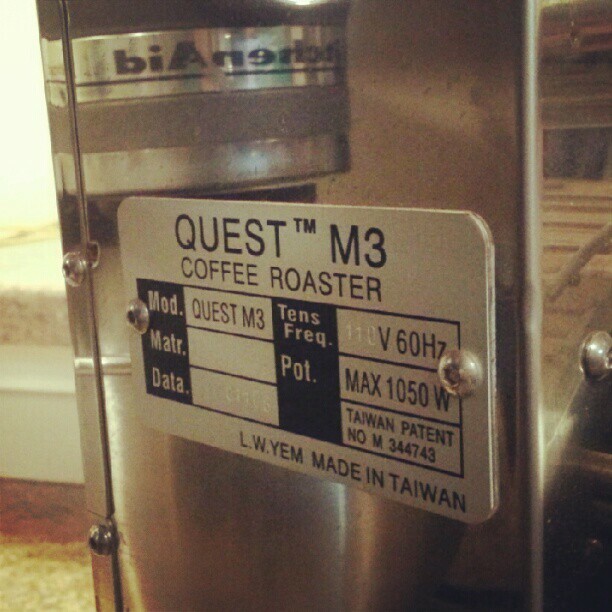 Our roaster is a Quest M3 Coffee Roaster. 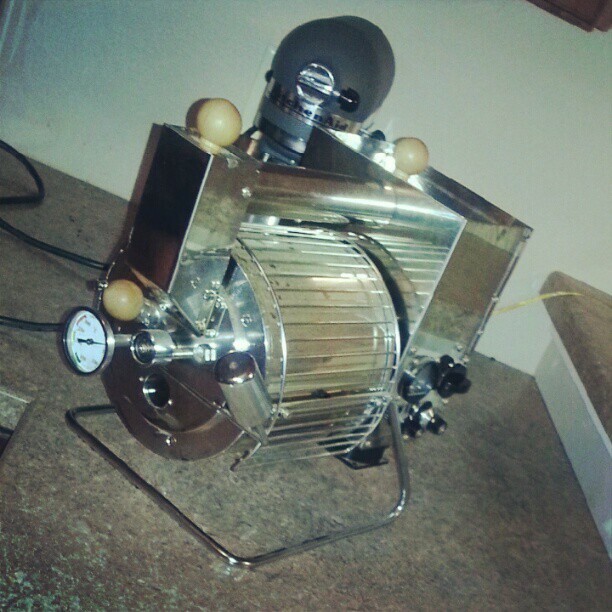 You will not find this machine on Sweet Maria's home roasting website, as it is a commercial size roaster. Sweet Maria's has great resources for learning about the different roasters available. 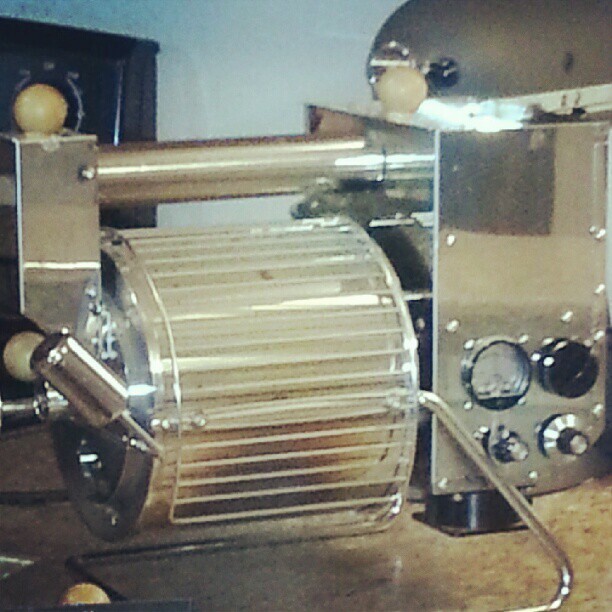 You can find drum roasters (which is what we have) or you can find stove top roasters like the whirly popcorn pan. 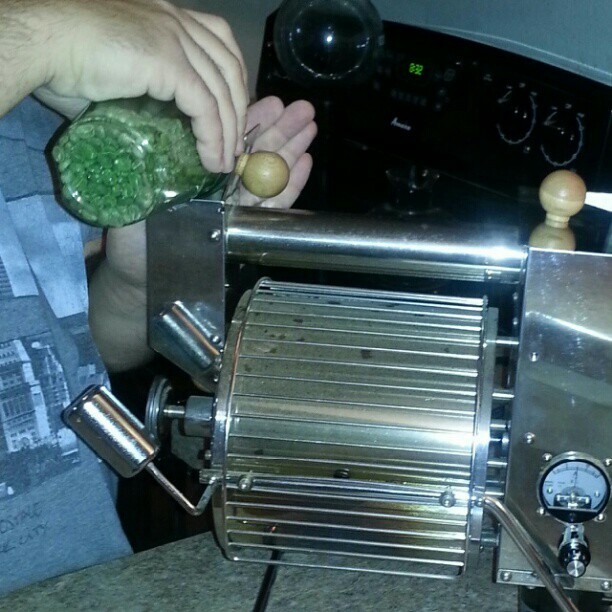 Did you know that you can also roast coffee beans with an air popcorn popper? You can literally pick one of those up at the second hand store for a couple of bucks! 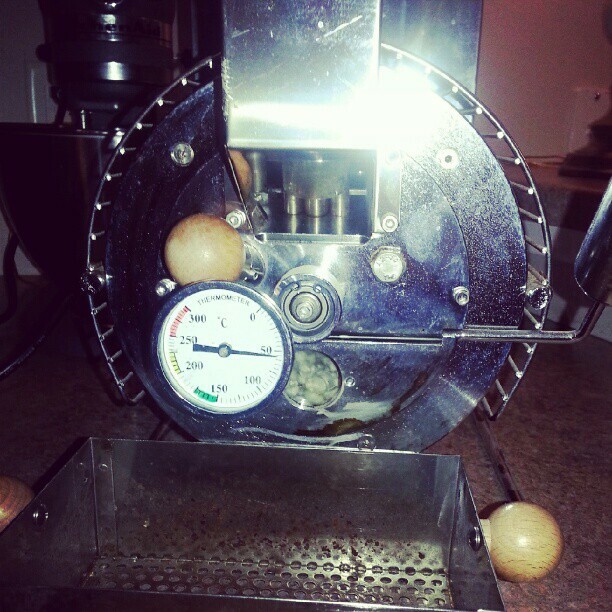 This is the second roaster we have owned. Our first was a Behmor 1600 which we also purchased from Sweet Maria's. It lasted us a couple of years. 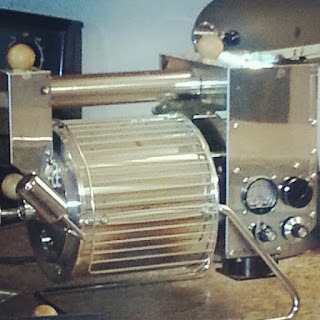 The Behmor that we started with is a $300 roaster. The Quest M3 is a $2000 roaster. The Behmor looks like a toaster oven. Sweet Maria's has a great resource page telling you all about why you would want to choose one type of roaster over another roaster..and how to even get started with home roasting...you can find it here. They even have a coffee library on their site and forums for chatting with other coffee roasting junkies. 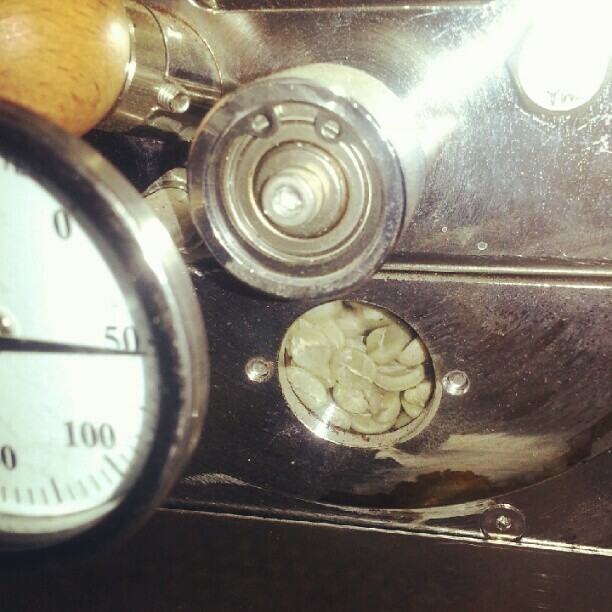 Also...when you buy your first roaster they will give you several pounds of beans free your first time. 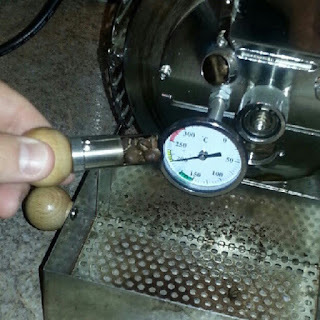 To the right of the temperature gage you will see a little whole where you can see your beans while they are being roasted to keep an eye on the darkness of your roast. 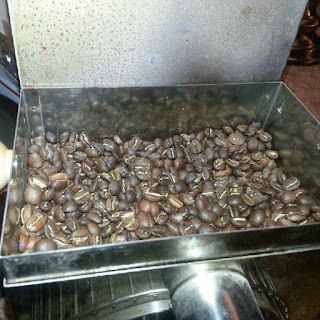 The first batch of beans takes about 15 minutes to roast. The machine has this handy little valve you can pull out and check on the status of your roast...according to this picture..it is almost ready. This is more like it. We are a medium roast type of people here. Not too light...and definitely not charred. Sitting in the pan cooling. And then morning happens...and bliss occurs! 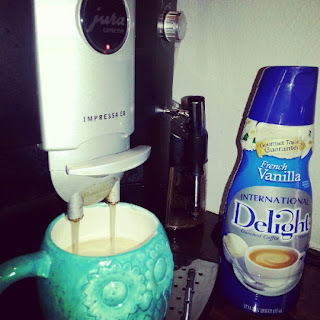 Of course my husband says I "ruin" the coffee by adding creamer...but I love my International Delight French Vanilla creamer so much...I just can't do without it. The coffee machine we have is the Jura Capresso E8. We love it so much that we have one at our office as well. Why roast at home verses store bought? Well...you just can't beat fresh roasted beans. Did you know that the coffee's peak aroma and flavor hits 72 hours after roasting? It's not like wine...it doesn't get better with age....it gets more stale with age. You want it to be fresh! It is so hard to drink anything else after you have consumed truly fresh roasted coffee. Another reason is because we can control the roasting profile of our beans....light? Medium? Dark? City? Full City? Does it save money? Yes! At least it does for us! We consume a lot of coffee! 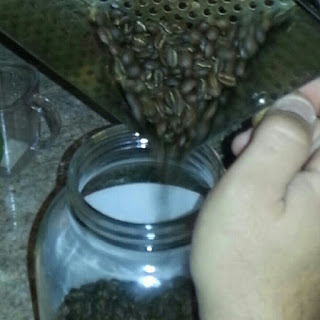 We were travelling to the big city of DesMoines once a week to get fresh roasted beans from Java Joe's downtown. We would be $12 or more per pound of beans...now it only costs us $6 to $7 per pound and we don't have to drive to get it! Can you choose the flavor? Yes, you certainly can. 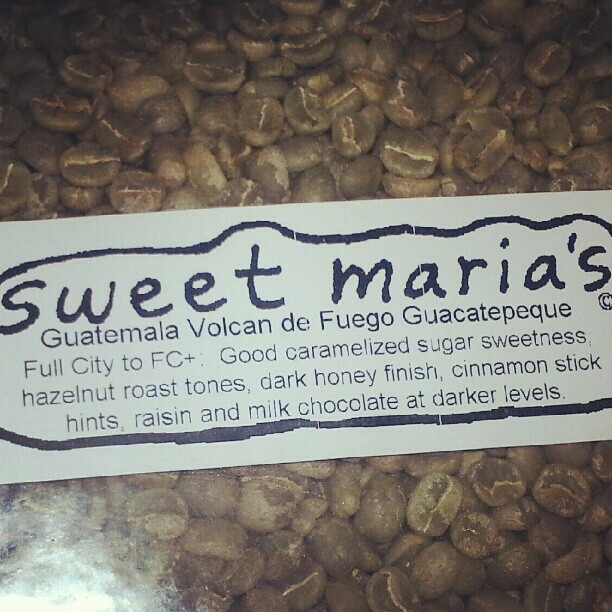 Sweet Maria's offers over 50 different beans from all over the world. Each has its own unique flavor. In the beginning you just have to experiment to see which are your favorites. Each have their own "profile" As you can see in the label in one of the pictures above. You can also add your own flavorings like they sell in the store like hazlenut or vanilla coffee...but we have never done that. For us that is considered "ruining" coffee. But if we were to do it...you add the flavor to the beans after it is roasted. Our personal favorite beans are Ethiopian Harar, Celebes, Guatemalan, peaberry....and so many more! I honestly have not had a bean from there that I have not liked! What other questions do you have? Will you consider home roasting now? Do you already home roast? Didn't win??? You still have a chance! Just comment on this post to be entered into the drawing...I will choose someone at the end of the day and you will also get a cute little jar full of beans as well! *only United Stated and Cananda eligible for this contest. *I was in no way shape or form compensated by Sweet Maria's to promote their company. We have purchased all of the items ourselves and sponsoring our own giveaway...all opinions are my honest truth and personal experience. Thanks for all the info - I may have to look into this a little more! ThaT Looks Like A Lot Of Fun! We Love Coffee And Home Roasted Would Be Quite A Treat! Thanks For Sharing. Random.org chose #4 as the winner...that means you! 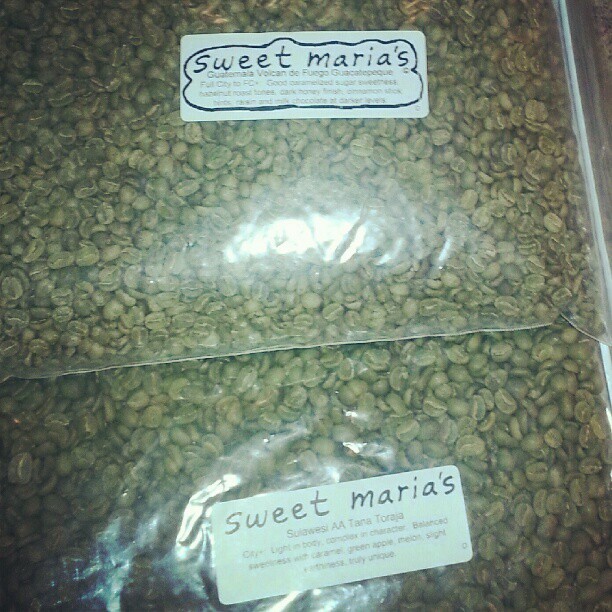 Email me your mailing address asap so I can get these super fresh beans to your home and in your cup! queenofthehouseofboys@gmail.com Congratulations! I will be mailing out your beans in the morning. If you can email me by 6:00 PM tonight that would be great! If not, I will have to choose a new winner as I want the beans to stay fresh! You have the best adventures! And I can almost smell those fresh roasted beans through the computer screen! I would think that it would be a no brainer that your neighbor should be the winner of the contest. I will expect River to arrive with the coveted prize soon!